Richard Blackwood’s face will be a familiar one for any British soap opera fans, having appeared on our screens during Eastenders 30th anniversary as the slick and manipulative Vincent Hubbard. While his powerful and captivating performances during this three-year period are something of a crowning achievement in Blackwood’s recent career, he has been producing a steady output of diverse and memorable prime-time appearances since the mid-90s. 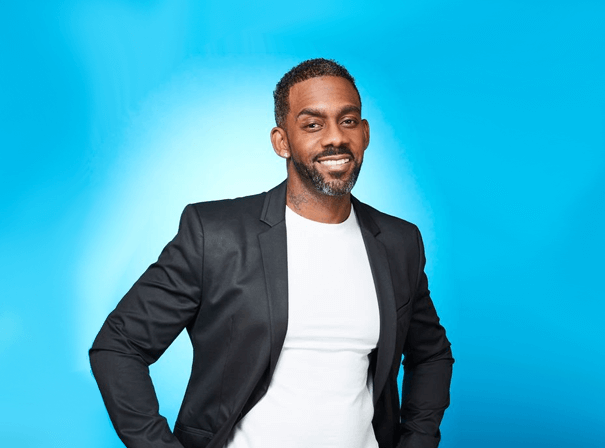 First turning his hand to presenting, Blackwood began his TV career hosting the dating show Singled Out, where his wit and effortless charm earned him the opportunity to host his very own show, The Richard Blackwood Show, on Channel 4. It was here that he not only developed his skills as a presenter, interviewing guests like Will Smith, LL Cool J and Mel B, but also developed his comedic talents, later put to use in the 2002 BBC sitcom Ed Stone Is Dead and on the pioneering 2001 satire series Brass Eye. Although acting and presenting are Blackwood’s bread and butter, he’s explored many other corners of the entertainment industry throughout his varied career. Aside from recording several top 10 charting singles and a top 10 album in the early ‘00s, Blackwood has graced the stage in London’s West End, appearing in both sincere and lighthearted roles: he’s acted opposite Adrian Lester in Tennesee Williams’ Cat on a Hot Tin Roof and shared a stage with Amanda Holden and Kimberley Walsh in Shrek: the Musical. All of this along with a peppering of reality TV appearances throughout this two-decade career, including the 2019 series of Dancing on Ice, has cemented Blackwood’s place as one of British entertainment’s most consistently charming, likeable and versatile performers.